fitness planfinish: "I've found a love for working out." "I've found a love for working out." It's one month until Christmas and my friend Whitney has more to celebrate than usual. 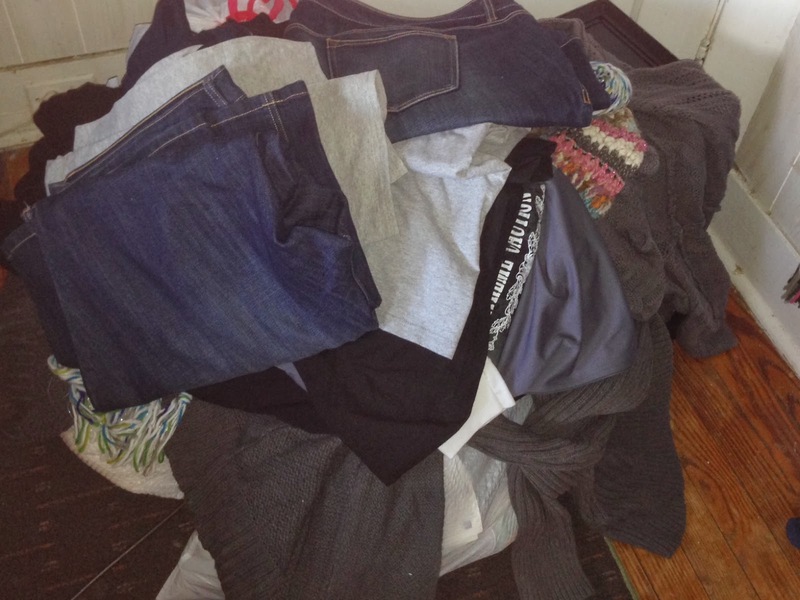 See Exhibit A above - a small mountain of clothes that are now so big and loose that she's finally letting them go. She's now four months into her training and happier than ever. Don't believe me? Read her testimonial below and get it straight from the source. There are some things I can do now that I felt I couldn't before I started training with Jenn. One was to simply go into a gym and feel comfortable. I've also found that I have much more stamina and confidence going into my workouts. For example, when we started, I struggled to just get through the 10-minute dynamic warm-ups. Now I I can get through it without feeling out of breath and having the overwhelming desire to give up before I even start. I have also found that the benefits of training go even further than looser clothing and better cardiovascular conditioning. Recently I was able to play in my college Alumni soccer game which I haven't participated in for a couple years because I felt that i couldn't play and didn't want to embarrass myself. This year I played in the game and did pretty well. In addition, all of my friends noticed that I seem happier and healthier. Moving forward, a couple things I want to tackle and look forward to is possibly completing a mud-run/short walk/run. I know that these are future goals because, right now, I'm taking it slow which is better for me. More immediate goals I'm focusing on is doing every exercise that Jenn tells me to do and to increase my reps within the time allotted. I also want to continue to lose weight by exercising and by incorporating healthy choices into my lifestyle - which I have been doing, but is always hard. I mentioned to Jenn that I stand taller now because that's how I feel (haha). Basically, when you have a stomach on you i feel like you naturally hunch a bit to try and disguise it. But now that I've working out and gaining confidence, I stand taller because I'm proud of myself. My 9-year old nephew, Jack, swears that I've gotten taller every time I see him. Even though I explain to him I haven't grown in years he still tells me, "Aunt Whitney, you got taller, don't lie to me". Through this experience, I am learning about the right types of exercise I should be doing for my goals, my weight, my limitations and how to complete them correctly so that I do not hurt myself which is very important. I've also learned that keeping a food journal is so helpful due to the simple fact that you forget what and how much you eat in a day. If it's there on your phone or a piece of paper you realize, WOW, I really should not have an extra snack right now. Also the staff at All Star Sports Academy and my coach, Jenn, have never made me feel like i couldn't finish an exercise or walked away and left me to try stuff on my own. Every time I work out, I have support from the other small group session attendees and/or the staff to keep me going. Now when I miss an exercise day I feel like crap and I can't wait to workout - even if my body doesn't feel like doing anything I always get in there and then I don't want to leave. I agreed to work with Jenn because I have been lazy for such a long time. I played three sports in high school and then college soccer and, through it all, I was told what to do and when to exercise. When i graduated college i just wanted to RELAX. Well, relaxing did not help me in any which way because I realize that it wasn't so much relaxing as it was being lazy. So I told myself that if an opportunity came up I had to take it because, if not, I would be an idiot. Jenn presented personal training at All Star Sports Academy to me on the off chance I would say yes and it was the best decision I have ever made. Now I've found a love for working out because I have seen improvement in myself and have overwhelming support from my family, co-workers and friends. I workout now for myself; not to please a team or a coach - just for myself. I have gained such an education on the body, food, calories, and exercises through this time spent training with Jenn that it has made a great improvement in my lifestyle. And, as the famous Carpenters sang, "We've only just begun...". Jenn: Way to go, Whitney! Keep up the amazing work and we'll be in that mud run together next spring!